Today’s post is in honour of all mothers celebrating Mother’s Day On Sunday, March 10th in The United Kingdom. Mothers are very special beings and we don’t realise what we have until they are gone. I lost my mother on March 10th, 1998. How appropriate that Mother’s Day falls on her 15 year anniversary. I miss my mother immensely. She was a very sociable person and enjoyed talking and entertaining. She was a great cook and excellent at improvising. I wish I had paid more attention when she cooked and had her wisdom and experience to guide me now. So, here’s to my mother and to all mothers celebrating today. I would like to send special wishes to my friends who are in the UK and who are mothers. When we were in school together, we were just children ourselves. Nowadays, these ladies are excellent mothers in their own right and I am in awe of each and every one of them. It seems like yesterday we were all playing in the playground at school, pretending to be Charlie’s Angels or reenacting Grease (at a convent no less). So, this White Chocolate Blackberry Tart is for my friends, all mothers in the UK and my blogger friends who are such special mothers also and I see how special every time I visit their websites. Now, since I am a Brit, I feel that I should also be celebrated 🙂 Unfortunately, my family isn’t falling for two Mother’s Days! I think mothers should be celebrated everyday so asking for two days isn’t so bad, is it? I’ll lay on the guilt trip tomorrow. This tart is a cinch to make and if you haven’t made your mum a cake or pudding yet, this is elegant and perfect. You probably have all the ingredients on hand and even if you don’t, you can substitute many of the ingredients. 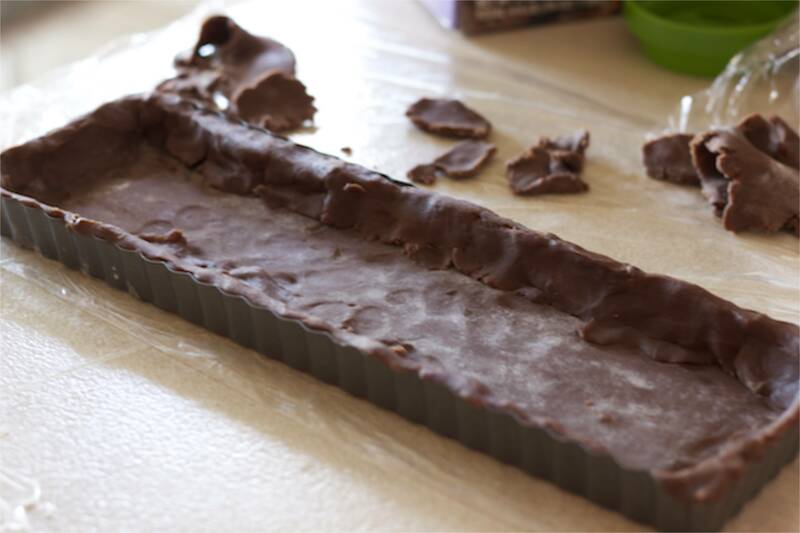 You can use regular chocolate instead of white and use any fruit that you have. Of course, if you have the time, energy, patience to go and get these ingredients, this tart is amazing with the sweet white chocolate pastry cream, the dark chocolate cookie crust and blackberries. 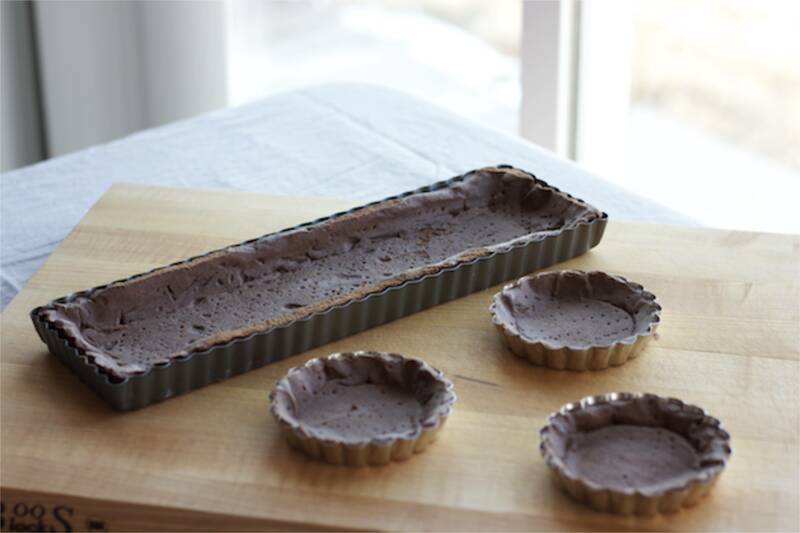 Chocolate Tart Pastry adapted from Rose Levy Beranbaum. 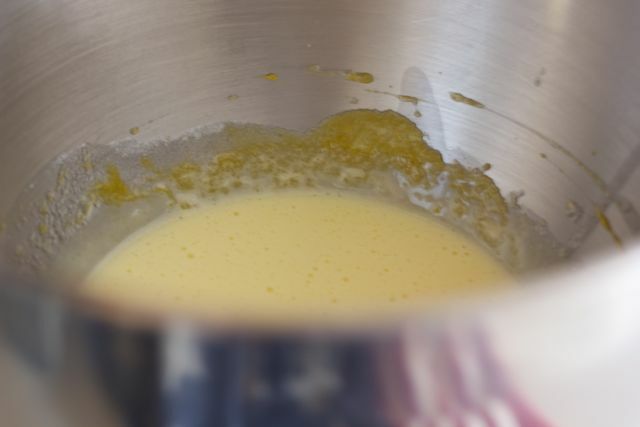 Beat the egg, egg yolk and ¼ cup of sugar together in a mixer until pale yellow and thick, about 4 minutes. Turn off the mixer and sift in the cornstarch. Mix again on medium low till well blended, scraping down the sides. Meanwhile, heat up the milk with the 2 tablespoons of the remaining sugar. Pour about half of the milk slowly into the egg mixture whisking constantly. 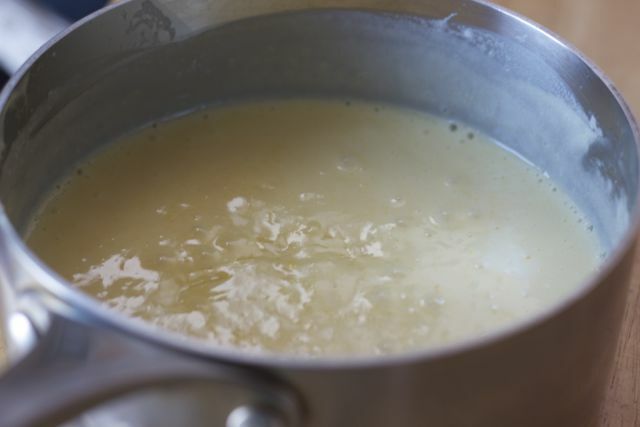 Then pour the mixture back into the saucepan with the remaining milk and on low bring up to boil to thicken. Whisk continuously to make sure it doesn't catch at the bottom and burn about 2 minutes. Once the pastry cream is thickened add the white chocolate and whisk thoroughly to ensure the chocolate is melted and incorporated. Put a piece of cling wrap right on the surface of the cream and refrigerate. Let chill for about an hour or two before using. In the bowl of a food processor, pulse the butter and sugar until the sugar disappears. Add the flour/cocoa mixture and pulse until the mixture resembles coarse meal. Add the egg and pulse until incorporated. Roll out the dough to 18" by 8" for a rectangular pan or 12" for a 9" round pan. Lay the pastry gently into the pan and trim excess. At this point, the tart shell can be frozen for use later. 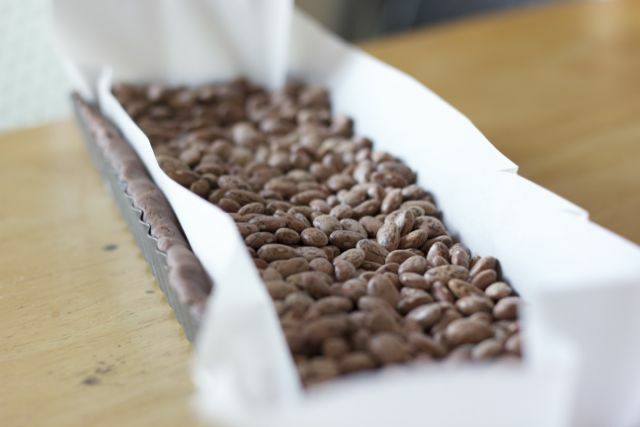 After 10 minutes, pull out the tart and line with parchment paper. Lower the heat to 375℉/190℃ and bake for 15/20 minutes or until set. 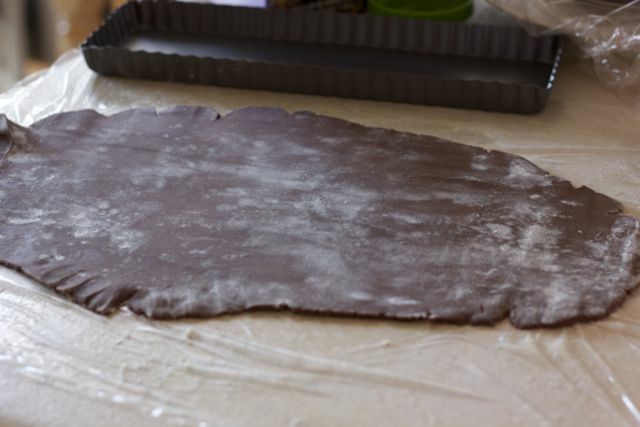 If the dough is not set, it will stick to the parchment more. Remove the beans or pie weights, prick lightly and bake for another 10/15 minutes. Remove from the oven and cool on a wire rack before filling. When the tart shell is cool, fill with the pastry cream and decorate with blackberries. * If you are making tartlets: bake at 375 for about 10 minutes and then remove pie weights and bake for another 2 or 3 minutes. If tart shells are frozen for more than 6 hours, you don't need pie weights. The pastry makes 8 standard tartlets or a 91/2" round tart. I had enough pastry to make 3 tartlets after my rectangular tart. Since this tart is French in all it’s components, I am going to enter it in March’s Tea Time Treats Challenge that is hosted by Karen from Lavender and Lovage and Kate from What Kate Baked. The theme this month is French pastries, cakes and bakes. I am looking forward to seeing what everyone else bakes up and if you want to check it out also and maybe even enter, Karen is hosting it this month at her site. Wishing all mums a very happy Mother’s Day! You are all awesome! Hope you all have a great day with your families. Inshallah I’ll keep her in my prayers, Sorry to hear your loss and thanks for sharing your story with us, it may help us to love our Mom more. I like tarts your beautiful click is making me mad, wish to grab one. Thanks Rashida. Prayers are all we can ask for now for her. I’m so sorry about your loss… This post is a beautiful ode to your mother and your tart looks divine. Belated happy mothers day! 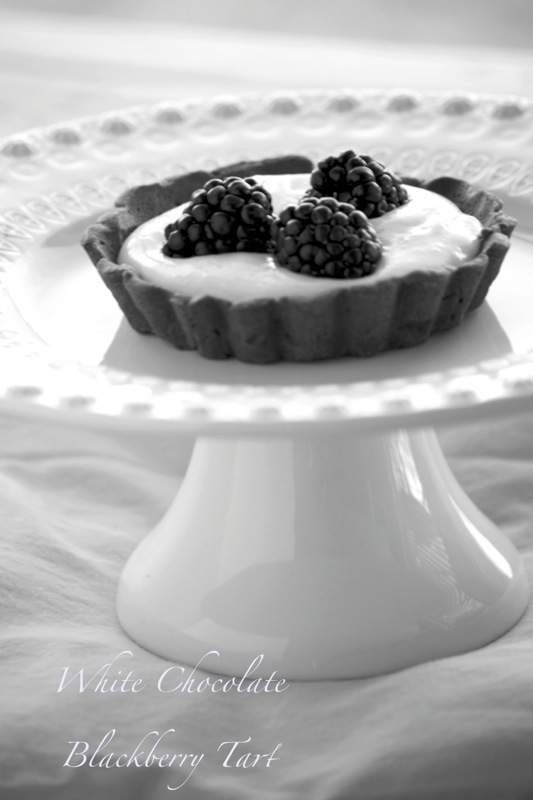 Mouth watering white chocolate blackberry tart and excellent photography..
A belated happy mother’s day!!!!! Such elegant looking tarts, I am sure your Mum is looking down with much approval. Thank you Norma and I hope you are right! This tart looks amazing! I am such a tart girl, love a simple delicious cream filling with berries on top! Perfect. I love tarts too Nat. I like to make them too because they are so elegant. Thanks Nami. The chocolate crust adds interest and a bit of a bitter tinge to the dessert. It’s a pleasant change. You can do it Nami! I’ve seen you bake amazing desserts! The choc base was quite nice against the sweet pastry cream. What I loved was the blackberries with the white chocolate. I do feel robbed of my time with my mum, but what I really feel sad about is that my children haven’t known a grandmother. Both grandmothers passed away before or while my children were babies. I want to bite into my computer screen right now!!! Beautiful tarts, Nazneen!!! Happy Mother’s day! The combination of white chocolate and blackberries is divine. I made something similar a little while ago. Thanks for sharing! Thank you so much for stopping by and leaving a lovely comment! What a beautiful tart Nazneen. It’s beautiful, the pictures, as usual, are stunning. Your Mum would have been mightily proud. She raised a wonderful daughter who now herself makes for a fabulous Mom. Happy Mother’s Day! Thanks Minnie for your lovely comment. I hope you are right and that she is proud of me. I try to be a good mommy. Thanks Karen, I am glad you liked it! This looks absolutely amazing nazneen… yummm!!! A very Happy Mothers’ Day to all the Mums in the UK!!! This dessert looks fantastic, Nazneen, and your photography is quite wonderful. Your opening photo in black & white is particularly beautiful. What a stunning tart! I love the white chocolate and berry combo – a decadent combo! Thanks Reeni! The white chocolate with the blackberries tasted so wonderful! Beautiful Tart Nazneen – your mum is one proud lady looking down on you! I feel for you. I know you’re not here but happy Mother’s Day! Thanks Lin! Happy Mother’s day to you! Hi Nazneen,Happy mother’s day to you from a mother! Mothers truly are special beings.I lost my mother in 2004 and it was mother’s day that year. It was hard in the beginning but now every year I thank God for how blessed I was to have her for a mother. Your chocolate dessert is a perfect treat to celebrate this sweet mother daughter relationship. What a coincidence, Nazneen. I made blackberry tart for the weekend also 🙂 without chocolate. Yours look delicious. Happy mother’s day to you. I am sure you mother is watching over you from Jannatul Firdous. I lost my dad at a very young age and there’s never a day that goes by when I do not remember him. Thank you Lail. How was your blackberry tart? they had a great sale on the berries here so I took advantage of it. Thank you Hari for your kind words and welcome! I look forward to seeing you around. Your tarts look lovely and yummy, Nazneen! Thanks Denise! They were yummy! Thank you Maureen and I think you should make it for yourself! Why not? We deserve it.